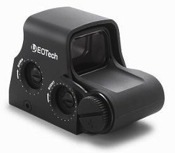 When it comes to holographic weapon sights, EOTech literally wrote the book. 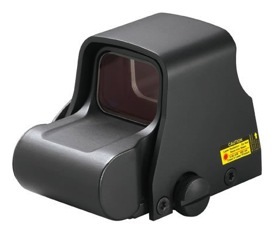 The XPS2 is a second generation holographic weapon sight that has a circle-dot reticle composed of a 65 MOA circle centered on a 1 MOA dot. This allows for rapid target acquisition with the option for a more accurate well-placed shot if needed. Like all EOTech sights, mounting is easy as long as the firearm has a Picatinny or Weaver rail. The sight features large adjustable screws for windage and elevation that are clearly marked to identify which direction to adjust the Point of Impact for the strike of the rounds. The sight runs on a single lithium battery that is designated for up to 600 hours of use. While I prefer the AA batteries on the larger models, the single battery helps keep the size down. I have used this sight on a carbine as well as on a Browning Buck Mark target pistol. The weight is around 8 ounces and barely noticeable on this type of pistol. It is pricey for what it is, but if you want the robustness and quality of an EOTech sight in a smaller package; you need to look no further than the XPS-2.